It's week #5 for our Tailgating Time! There is finally a chill in the air here in Florida (well in the morning anyway) it does feel like fall, with less humidity and the temps are very pleasant in the low 80s! Come on and join the fun! We have lots of recipes and ideas for all you football fans! Even if we can't tailgate at the stadium we'll have fun right here, join us! Bring over your party dish, special chili or wings, salads, dips or pitcher filled with a punch! This week I'm bringing ginger-miso-tuna skewers check here for the recipe they are so good right off the grill. Chester here is bringing some nuts, he's not using a recipe, he just needs a bowl! Love the Ginger Miso Tuna, bet that's delicious!! I had Tailgating Time posted as week 4, you are right, I edited. PS - I love Chester, he's so cute! Tailgating can be fattening. Thanks for hosting. Ha! I'm glad I had it right! I was only hosting 4 I missed the first one! Chester is pretty gutsy too! Diane, I am sorry. I haven't been able to get online today until now. I will fix the link, thanks! comfycook - this shouldn't be too fattening, but I think tailgating is not meant to be diet food! hehe! Ha! Love the squirrel! Thanks for hosting, great recipes! Lyndz, love that cute little fellow in the photo and so is your grilled tuna! ^_^ Have a great day. Your tuna looks delicious--I love ginger and miso with tuna. 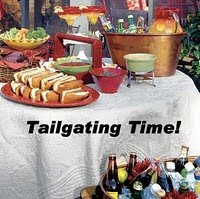 Your tailgating event looks like fun too--some great looking food. The ginger miso tuna skewers look fantastic! Love the cute little squirrel! It looks like you are about to have tons of fun at this tailgating party! The ginger miso tuna skewers look and sound delicious! Your skewers look delicious! Love that glaze! And what a cute squirrel - we have some that come by our back door begging for peanuts. Those tuna skewers look fantastic. Definitely bookmarking those.